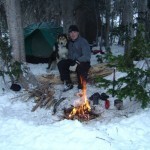 Winter camping is an adventure that you will enjoy if you are prepared. Always remember that there are possibilities of severe weather that you have to be ready for at all times. An article that I always turn to that has great content on winter camp preparation is Winter Camping: Preparing the Camp and Getting Through the Night. Wind protection – using land rocks or trees to protect your tent from wind gust that may be a hazard overnight. Now that you have all this planed out & you know where to go you have to plan on your winter supplies. Setting up your kitchen can be a challenge you will want to pay attention to, Keeping your stove out of the wind as much as possible is important. You will want a kettle for melting snow, small fry pans of lightweight construction & one iron skillet. can be a small 6 – 8 or 10 inch skillet. This holds heat even in the coldest weather. You’re going to want to heat your tent late at night before you turn in and early mornings when its around zero you will want to be sure that it is going to work when you need it. If you’re using a wood stove make sure the chimney is properly set up & you have plenty of dry wood for this. because being damp is never good wile camping outdoors in the winter. I just want to say I’m newbie to weblog and absolutely savored your web-site. Very likely I’m likely to bookmark your website . You really have outstanding articles. Thanks a bunch for sharing with us your website page. Great post with good tips for seeting up a winter camp! Good post. I learn something new and challenging on websites I stumbleupon on a daily basis. It will always be useful to read content from other authors and practice a little something from their sites. I read this post fully about the resemblance of latest and preceding technologies, it’s amazing article. What have we learned? That soda bread comes in all shapes, sizes, and compositions—but it’s got to be flour leavened with soda and some kind of acid. Let’s see how we can do!